The need for computer monitoring tool or spy is very common now. 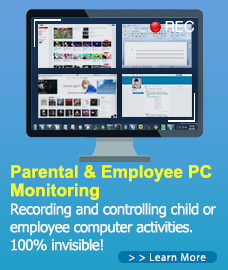 Many parents wish to have something which can keep an eye on their child’s activity while sitting on computer. Many companies CEO’s are worried about their non-committed employees and wish to find out what they do in office time. Well, there indeed are such tools which can spy and record all the activities of your child, employee or student on computer. SurveilStar is a computer monitoring tool which records all the activities of user. It will record everything including chats, emails, applications, files etc. you can see their online activities and much more with the help of SurveilStar. All you have to do is to download it and install it into your computer. It will automatically start working and spying. You don’t have to start or stop it. Not only that you can also restrict many of their activities. SurveilStar software is for anyone who wishes to know all the activities of people using their PC. It is the best parental control. Parents can see what their children do on internet. They can see the record of websites they visit, read their chats of both sides, read their emails and see the pictures and videos they download. Parents can protect their child from Internet abuse. Also, those who wish to record their employee’s activity can use SurveilStar. See how much time they are giving to your work and how much time are they wasting. Also, you can block some activities for both employees and children. Not only that many internet cafes and school labs can use SurveilStar to protect their computer from misuse. Email- see the emails they send and receive. With every new email receive and send you are notified. Also, you can see the files they attach. Network- it records the IP address, network traffic etc. you can limit the speed of internet bandwidth and port. Password-all the logs are saved in an encrypted file. You can see them via email id and you have password protection. SurveilStar is an excellent software and unlike many other software it is more efficient with more great features. SurveilStar can work best for any office, home, school and café. You can easily monitor all the activities through this great monitoring tool. This entry was posted in Computer Monitoring, Data Security and tagged computer spy, ExtraSpy Employee Monitor, spy employee, spy pc, Spy Tools Reviews. Bookmark the permalink.